"When I am an old woman I shall wear purple." 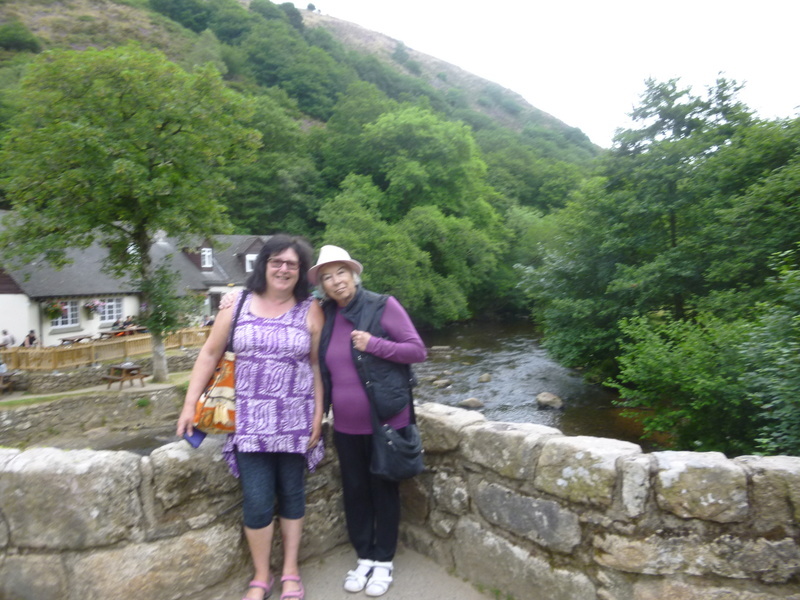 Me & Helen at Fingle Bridge, Dartmoor. Are you going the whole way with 'wearing purple and a red hat' by learning to spit? Helen, I bet Lynn is keeping you in stitiches. She's so funny. Gawd - and Lynn says I look 'slim'!! Bloody 'ell! We had a lovely afternoon yesterday, also with her lovely husband Nige, who is a real sweetie! He even drove me to the station this morning! I have a few photos & will post them soon - I feel a tad washed out at the moment, and have just got Stanley home again. The flat stinks of paint, as the landlord had it painted (the hole in the ceiling!) while I was away. And I've no idea how long it's going to take me to get the laminate floor looking decent again. What a mess. And of course, I have hardly any food & the shops are shut now. Hey ho. I'm currently succeeding with the 'grow more fat' bit, which makes me want to spit every time I see a photo of me. Helen had me in stitches, we did have a good laugh. Helen sorry to hear the state of your flat, have a good rest. Hope your hip's ok after all that walking we did. Helen, I saw my friend who works at Kent's Cavern. She wasn't there the day we went. She told me about a couple of experiences which made her think the caverns are haunted. If such things do exist, it's not surprising that there are ghosts there, given that it is Britain's oldest human settlement. She was guiding a tour, stopped in one of the chambers to speak to her group and out of the corner of her eye she saw movement in the next chamber, thought it was another group tour, carried on her talk. Then she remembered there was no other group in there, so she looked to the side again and saw what she can only describe as wind rushing through the chamber (although she knows you can't see wind!). She turned again to speak to her group and felt a distinct hand on her shoulder. She had her back to the wall, no visitors behind her, nobody right next to her, yet it was a definite firm touch pressing down on her shoulder. She had to stay calm, continue to give her talk and not mention this to the group of visitors! Another time a group of pagans wanted to do an Imbolc ceremony in the caves, they came with drums etc and my friend had to attend in case any of the group wanted to leave the cave. The group chose the chamber which (unknown to them) is reputedly the most haunted. After the drumming, as they were preparing to leave, she heard a kind-of whooshing and felt something rushing towards her, she stepped to one side and again she said it was like visible ball of wind rushing past her towards the exit. Since then there have been fewer spooky experiences reported in that chamber. Ghost of this guy, maybe?! 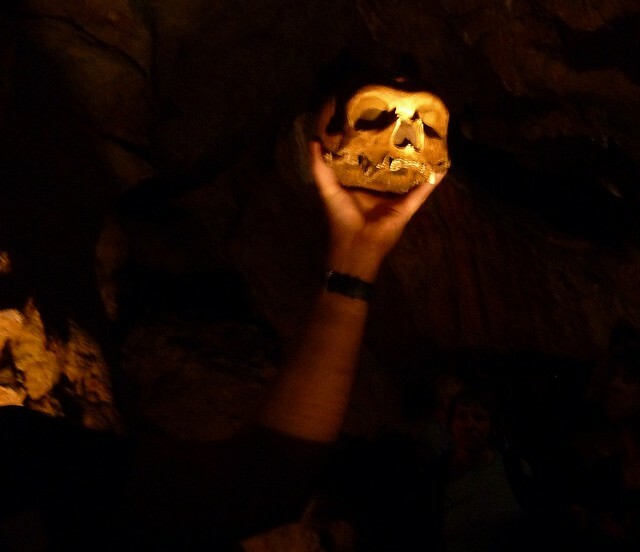 Is that the skull that our guide held up when we visited? The Shakespeare quote is very appropriate, we have seen 3 Shakespeare plays performed in the caves, but not Hamlet! Kent's Cavern was featured on BBC2 today, on the Digging for Britain programme, when they found a new entrance & the remains of a brown bear from the Ice Age - very exciting! It MUST be dark in there. Michael, Thought you might be interested to see the plans to re-develop the Corbyn Head Hotel (Phyllis Court where you used to work).